I pride myself on knowing all sorts of unique preserving methods and recipes that make the most of each season. I’m also incredibly thrifty, preferring (with food, at least) to make, grow, barter, or glean what I eat rather than buying ready made. So it was shocking when some amazing culinary artists in my neighborhood announced that they had made a limited-edition product that had never even occurred to me before. Frances Rose and Acorn of K Is for Kitchen offer lots of different culinary services in our West Philadelphia neighborhood, and one of those is making ethically sourced value-added products. They make all manner of sauces, butters, pestos, and other treats, rotating with the seasons. And they has a little stash of a very special honey, a summertime wildflower honey infused with (wait for it)…dandelion blossoms. Such a simple idea! How had I never seen or heard of this before from any farmer or forager I’d worked with? I had to try some — luckily, I was able to get my hands on a jar. My first thought is that the flowers might add some bitterness to the honey — not unwelcome in such a sweet food — but I was wrong. 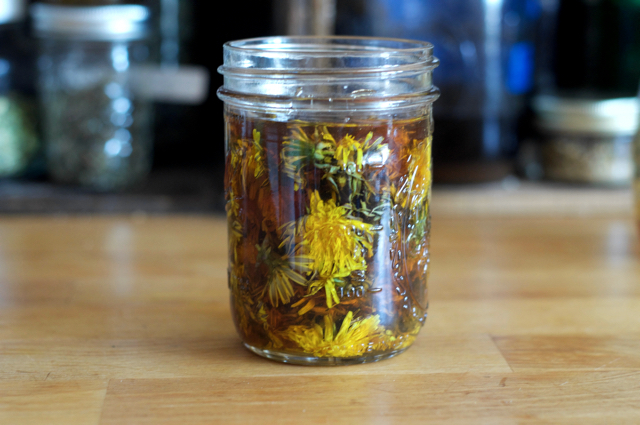 The dandelion blossoms add a bright floral quality and a depth to the honey’s sweetness, creating complexity by combining two utterly simple ingredients. To make this delectable treat, find a field or lawn where you can be sure that the plants haven’t been sprayed and the soil is not contaminated (the front yard where I live fits the bill here, but there are plenty of urban green spaces with dandelions that I wouldn’t use for food — so select your site carefully). The dandelions should be in full bloom, big and fluffy and bright yellow. Then, simply snip or pick the heads of the flowers off and collect them in a clean bag or basket (I cheated and used my straw gardening hat). Leave the stem behind, but the green calyx just beneath the flower is ok. I collected three or four big handfuls, which were enough to mostly fill a pint jar. When you get back to the kitchen, go over your blooms carefully to make sure you’ve removed any bits of grass, leaves, or stems and any hitchhiking insects. It was too early for spring honey, but I had a jar of local wildflower honey (probably from last fall’s harvest) on hand to infuse. Then loosely put your flowers in the jar. You don’t want to pack them too densely or else the honey won’t penetrate. Pour over the honey and then give the mixture a few stirs with a knife or chopstick to make sure the flowers are submerged and remove any bubbles that may be trapped. Then, simply pop a lid on your jar and set it in a cool, dark place to infuse. Give it at least two weeks, then taste; leave it longer for a stronger flavor. The flowers will take up less space once they’re suffused with the honey; if you have room in the jar and want to add another handful or two, you can do that, too. 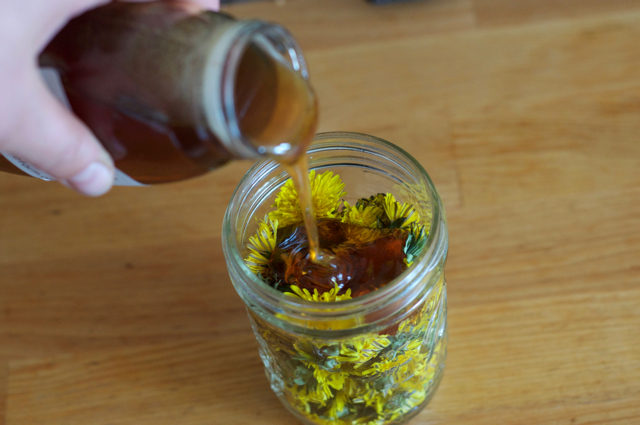 When you’re ready to use the honey, there’s no need to strain the flowers out — I find they look really pretty in a jar or even in a pinch bowl for serving, and I just add them to my herbal tea when the rest of the honey is gone. 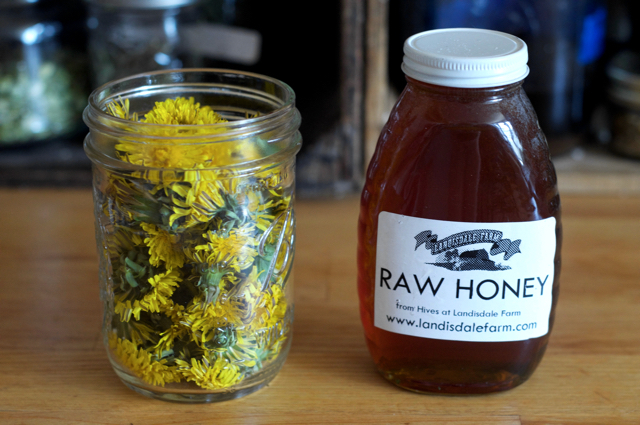 Dandelion honey is less of a recipe more of a reminder that in a long-coming, cool spring, even the humblest of weeds presents an exciting opportunity for beauty and flavor. Spring is ephemeral, and this is one way to capture a really special part of it. Your honey will keep for up to a year. Interesting. Not sure I feel so comfortable using the dandelions here in lower NY. ? 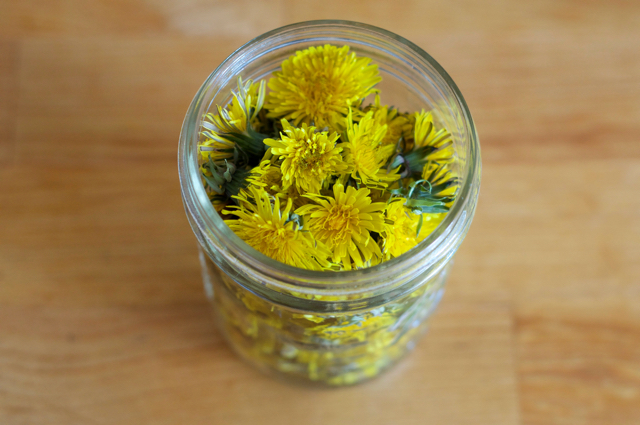 You don’t wash the dandelion flowers before packing them in the jar? Nope. Again, you want to use really clean, fresh blooms from an unsprayed source far from the road. Then you’ll just inspect carefully for any insects or debris before adding the flowers to the honey. Agreed it is a simple and surprising idea that sounds delicious. Look forward to giving the infused honey a try. We have oodles of pesticide free dandelions. 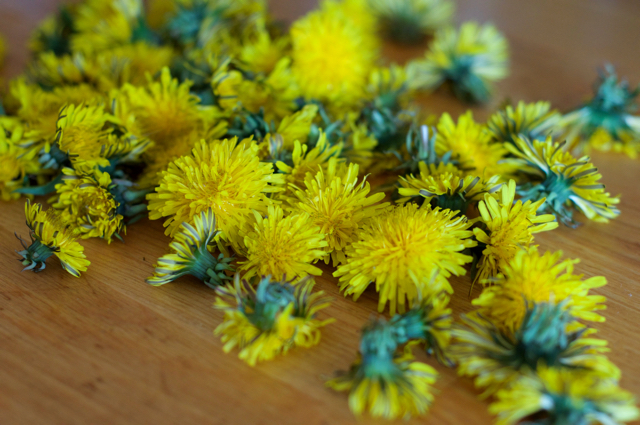 I imagine that the honey-infused blossoms might also make tasty dandelion fritters–perhaps with no additional syrup necessary (dandelion syrup or other).